Let’s make buying easier and faster by combining matching styles in one bunch and cutting the price to save you money. Is that a cool idea or what?! Scenario One: You’re in a pinch. You need to get a great gift fast online for someone with sensitive ears. You certainly want to give them more than one pair. And, it would be really nice if they went together in theme. Tada! Gift box right here. Scenario Two: You’re hunting for a set of earrings that match. Someone you know has shown that they are now nickel-sensitive to earrings. You’d like to get them help since they can’t wear any of their old earrings. 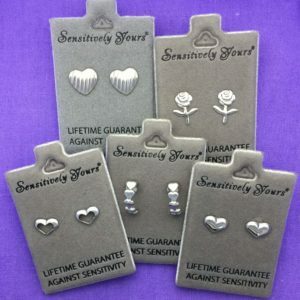 With an earring gift set, now they have an immediate solution and options for their tastes. Mission possible. Scenario Three: You want to get earrings for someone and you have no idea what to get. (Oh-oh.) Inside you mind, you ask “Do those styles go together? Do these over here? I don’t know!” Here, we’ve taken the shopping stress out. Gift sets are great for boyfriends, husbands, dads, and everyone else with potential hypoallergenic earring shopping anxiety. Get the gift set and relax, you’re done! Take a bunch of matching styles of earrings for sensitive ears put together in one collection for shopping ease. Mark down off of each style, saving money off of the price to buy each separately. Click. Repeat. Here are our most loved earring styles, assembled for you in one gift box, perfect for every occasion. Each of the styles was chosen from our most popular styles of earrings. But Are They Just As Good As The Other Individual Styles?